568 pages | 20 Color Illus. | 137 B/W Illus. Read Philip Weinzimer’s recent article that appeared on CIO.com. Given recent changes in technology and business, the CIO role is effectively a new job. Phil Weinzimer's book is a fantastic owner's manual for CIOs, whether you are one, aspire to be one, or want to work more effectively with one. Technology change is constant, always driving business model change—but Weinzimer has correctly captured the current disruptive velocity and magnitude of both, and the criticality of a different breed of CIO to harness these seismic shifts…. An inspiring resource for CIOs, and aspiring CIOs, looking to transform and disrupt their industry. The role of the CIO is changing faster than ever before. The best CIOs today combine compelling vision, disciplined execution, strategic delivery partners, and strong teams to deliver exceptional business value. In an IT world where the war for top talent continues to escalate, The Strategic CIO is a practical guidebook to taking your IT function to the next level. Weinzimer has correctly identified what CIOs need to do to have a strategic impact on their business and industry and does so with a practical guide, based upon CIO success stories, as to how to get it done. 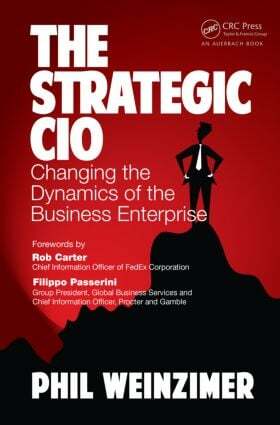 A must-read for CIOs who want to make a difference. The Strategic CIO will help CIOs and other c-suite executives understand how to implement the strategic imperative for timing leadership … when IT needs to focus on operational details and when to promote information technology driven strategic change. Phil Weinzimer is president of Strategere Consulting and works with clients to develop business and IT strategies that focus on achieving business outcomes. Mr. Weinzimer was previously the Managing Principal-Professional Services for IT Business Management at BMC Software and was Managing Principal in the Professional Services organizations for ITM Software, CAI, Sapient, and Unisys. Management experience includes executive positions in the defense and manufacturing industries in the areas of Vendor Management, Materials Management, Operations, and Finance. Mr. Weinzimer's consulting experience includes building and leading consulting practices, selling Professional Services, managing multiple engagements in the US and Europe. Industry experience is in Health Care, Manufacturing, Pharmaceutical, and Financial Services industries. Mr. Weinzimer uses creative and innovative coaching techniques-through workshops-to enhance new organizational skills, knowledge, and teamwork in IT Strategy, Process Redesign, and Organizational Change. Mr. Weinzimer’s new book, The Strategic CIO: Changing the Dynamics of the Business Enterprise, to be published in September 2014 by Taylor & Francis, focuses on how CIOs strategically transform IT organizations by leveraging information and technology to create new customer value, increase corporate revenue, and enrich shareholder value. His previous book, Getting it Right: Creating Customer Value for Market Leadership, published by John Wiley, focuses on transforming an organization using a 3P strategy: PREPARE personnel to work together as a team, PERCEIVE customer needs, and PROVIDE new products and services that create sustainable and profitable value. Mr. Weinzimer speaks regularly on IT strategy and writes an ongoing column for AITS.org focusing on The Strategic CIO, and for CIO.com on the subject of Transforming IT for Business Success. Mr. Weinzimer has written articles for CIO magazine on the subject of strategic CIOs, and co-authored a case study for Harvard Business School (HBS). He is also a journalist for Sarder TV, a division of Netcomlearning, interviewing CIOs, IT and business executives, and academic thought leaders on the subject of leveraging information and technology for competitive advantage. Mr. Weinzimer also hosts a video series on AITS.org, The Strategic CIO, interviewing business executives on the strategic use of IT to create customer value, increase margins, and enhance shareholder growth.